It's June already! Wow. Time flies when you're under deadline...anyway I am still up and dedicated to getting the book done this month (esp. since it should really be in NY by July 3, urgh). I'm tired, so bed now. Halfway done through the June website update, so must do that today. Prize will be small rosewood box with amber resin...for the box that Saille put his HeartGift in (Heart Dance). I took yesterday off after dealing with the fridge crisis and dropping by to see my Mom's cat. Did check email, and I think I have a couple of comments to reply to here. Then I need to work on Heart Journey for critique. Yes, it should have been in to my editor by now, with Heart Change, but it isn't. Anyway, I'm late. Current new thing, I'm backing up on Carbonite since it's reasonable $50.00/year and Linnea Sinclair swears by it. I also need to finalize my website update (ok, do most of the work), and throw myself on Rae Monet's mercy to get it up today or tomorrow. So on to work! Thanks for all the comments, and I know we've been going more than two (three?) years now. 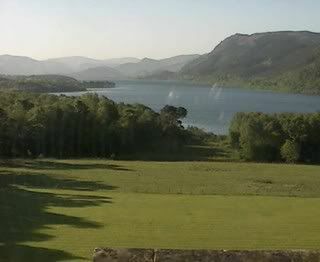 May you have a lovely summer's day. Ok, got to bed late last night, early this am, like 1:30, Tommy whined me awake at about 7:30. Worked (but did not make word count) until 10:30 am, housestuff til 1pm, then massage, then to Mom's to spend time with Wilbur and worked some til 7pm. Walk into the house I'm sitting (checking on, doing sprinkler), at about 7:40 pm, hadn't been there since yesterday am. There's LOTS of water on the wooden floor. In fact two mats are wet...and there's water dripping from the ice maker on the freezer side. I can't open the freezer section. A little panic...then I settle down...many calls to the guy, went to next door neighbor, called Amana, they think the door is frozen shut. Called bro (black sheep), he and nephew come and move the fridge away from the wall, detach the back, and the ice tube/coil, check out the basement (I'd wiped everything up), and moved the fridge from the wooden kitchen floor to the faux stone floor in the entryway. All this until 10:30, say, and neither of them (both strong men), can get the door open. So I am at home to take care of cats. Would go back now, but I need gas first, and, like, it's very dark and I'm tired. So I'll be signing off (haven't checked my email today so may glance at it to see any emergencies), then will probably fall into bed. Body is beginning to complain from deep tissue massage. May all your refridgerators work today. I didn't report on the booksigning but it was the best ever at a store! Really, sold quite a few books, met nice people, had fun stories told to me, talked publishing with Lynda and Melissa. All in all a lovely time. Ok, just got my daily wordcount done. The desktop is still in the shop and I'm using the laptop, which I don't care for as it's become my writing computer. I've also been making the rounds. Catsitting for a friend over the long weekend (Fri-thru yesterday), spending some time (and one night) at my Mom who has been gone for going on 2 weeks and Wilbur is lonely enough to see me as a good substitute, and dropping by the house of a friend of my Mom's. I COULD set up as a petsitter/housesitter, I think, but after these rounds I figured it's not something I want to do. I've dragged my laptop around with me (still not used to the Asus) and only have managed to work at my Mom's. Their homes are not me. Even if I ever inherit Mom's condo (which is the one that would go to me), I wouldn't stay there. I chose my home for it's charm, and I have an incredible amount of stuff (which I'm trying to de-aquisition), and even if I put my stuff in her condo, it wouldn't feel right. I was caught on the highway in evening rush hour, so I got off and found myself near the neighborhood I grew up in and drove by that house. I haven't lived there since I left for college and due to a long, sad story, it is no longer in the family. It was a little eerie because the only time I visit that neighborhood is in my dreams...still. And one of the reasons I bought this place was because it wasn't a ranch-style home. I DO believe there is a place that "calls" a person, a perfect home. But I haven't found mine. I love my house and my neighborhood, but if I found that place that resonated, I'd probably move. And I'm using the above idea in my next Heart proposal, which I'd hoped to have done and emailed today. It isn't. I need to set aside a weekend just to work on the thing, but the looming Luna book deadline puts me off. Anyway, that's that, and now to look at email that I haven't checked out since Saturday...shudder. May all your dreams -- waking and sleeping -- be satisfying. All right, I think I've taken care of the comments. Since I'm on the laptop again (which I try to keep solely for writing), I haven't looked at every single one, so if I've missed a comment I should respond to, let me know. I think I've been whining too much lately and should get back to Writing and Publishing info. Anyway, I was working on sewing up my chron chapters to the farthest I have them in sequence (I think about the middle, but I have lots of other bits and pieces after that, including a large chunk of before the battle, a little during the last battle, quite a bit after the battle, and three endings I have to either meld together or decide which is the best). Some scene threads I had in chapter two have been moved and I'm ready to pay off a set up that I've had since Guardian of Honor, so I was reading early editions of chapter two...including my proposal. There is a subplot in my proposal that I didn't include in the book. In the proposal, I had the man who'd attacked Raine get away and stir up others like him (who had innate repulsions to people from our world) to form a group and attack Raine and the other Exotiques and disrupt the invasion force, or something. In my ms. the attacker is literally put on a ship sailing away to distant lands, probably never to be heard of again. I wanted Raine to have security, know that that particular problem was gone forever -- and the reader, too. Why did I change this? Because I have plenty of other things going on, thank you very much. I have Raine and her tasks (3) and love story with Faucon. I have Jikata and her learning of Lladrana and lessons with the Singer. I have the invasion task force forming and Luthan and his issues with other people. And, soon, Jikata and Luthan's love story. In my proposals -- esp. the Luna fantasies -- I tend to put more plot in than I need. Probably because I don't have the book totally formed in my head since I'm not writing it yet. So a proposal is "this is what I think will happen, and trust me, baby, the main plot/conflict, will remain the same." So far the worst has been Protector of the Flight. I had a little subplot with the Singer that didn't get in there. I had 1/3 more story (in a different direction) than I actually wrote, which would have made it a completely different story, and I think it's a better story the way it is. Maybe, someday, I'll put the proposal synopses up on my website, but the problem with that is some people who haven't read the books will read the synopses, say, "Oh, I don't think I want to read this." And, again, trust me baby, I need all the readers I can get. May the threads of your life be golden today. Yes, I know that I should have mentioned this, like, Wednesday. The past few days have been hectic, I'm housesitting again for my Mom's friend, and my other person I catsit for went out of town for the holiday. I've been all over the city this am. The computer is much better, but the original problem has not been solved so I'm lugging the thing back to the shop in about an hour to be there when they come in. I really trust these guys, they're cheerful and they're reasonable. With Lynda Hilburn, Melissa Mayhue. Smooches, and may your day go smoothly. So how come every time you (I!) have a computer problem it can't possibly be an easy fix? Anyway the desktop is in the shop being cleaned of dust and cat hair (imagine that), and fitted with a new wi-fi card. I bought a new wi-fi system but it's not up yet. My new baby Asus came yesterday and I love the looks of it. I'm not sure of the keys. I have small hands and fingers, but it seems the keys are smaller still, and stiff. Especially when compared to this laptop, and the laptop keys are, of course, not nearly as nice as the desktop's split ergonomic keyboard...I think I'm definitely going to have to trim my nails. OTOH, it opened my wp files fine. The screen is very little, so I'll have to get used to that, too. So, I am hoping to have the desktop back today but don't know if that will work. I'd sorta been told it would only take a couple of days, which was yesterday, and if I don't get it today there will be the long weekend. Working in my office on the laptop is weird. I like working on the dining room table with it, and keeping it pretty much for writing. So I unplug it from the cable when I want to write and take it downstairs, then for stuff like this and email, I bring it back up. I am liking Memorial Day Weekend. It FEELS like a holiday to me, and is welcome since my days seem to meld together. I think that's all I have to say, except I've been pretty much making my morning wordcount which can be my daily wordcount. Errands have taken up the afternoon. So may you all have a lovely weekend. And go see Indiana Jones! We haven't planned a group outing so it looks like I'm going to be on my own there. Name A Character/Decide His or Her Fate in a Robin D. Owens Book! 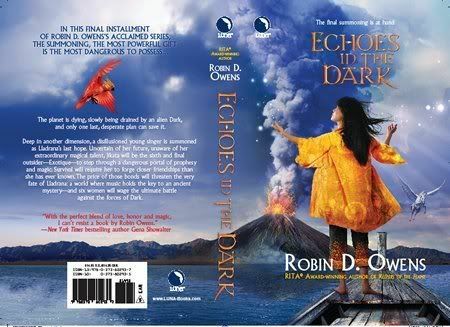 ECHOES IN THE DARK (Luna Books, January 2009) is the final book of Robin D. Owens' award-winning "Summoning" series that Huntress Reviews said "is among the most joyful series of novels in any genre. It deserves to be considered a classic." Now YOU can choose the name of a character (with a minor speaking part) in Echoes In The Dark. More, YOU can determine whether this character lives through the final battle with the evil alien Dark, or dies a heroic death. Note: This is an equal opportunity battle, the character can be male or female. Even more input will be considered from you if you're familiar with the Summoning series. Character name and fate must be chosen as soon as possible as the book is under deadline. May you all enjoy the Power of your imagination. Note: If you use a real person's name you will have to sign a release. It finally occurred to me that I could probably plug the cable from the desktop into the laptop. Did, and the comcast guy walked me through resetting the computer, the modem, etc. So I am SET for tonight. Won't handle the current wireless issues, wifi etc. for this laptop machine and the new baby coming (more later), but it definitely gives me more time to put it up, or like, clean my office so a friend can come over and configure it (already spent a bunch on a network this am). I'd really like to move around the house with the laptop. Our local coffee shop has access but it is secure and for reasons unknown to me my program won't give me a chance to log onto a secure network. I dimly recall a little popup box but haven't seen that for a while. Geek Squad, of course, said that they fixed this but it hasn't worked since the laptop crashed. Ok, I'm cranky...I'm also on my way to a computer store to buy a wi-fi router and see if I can set up a network in my house by the chat time tonight. If not, I'll be at a local library, but will have to leave a little before the full hour since they'll be closing and probably kick me out. Slept in late and haven't gotten any writing done yet. Did some sewing together yesterday which went well but didn't produce the full wordcount. So, that's that. I will be the ONLY one on the Novel Talk chat, so come see me! 9pm Eastern! There will be prizes (to be determined when I'm less grumpy). May you have a lovely day...and spelling as a child was a nightmare...thought I'd gotten better. I like the colors very much, the Ship should be more like a pirate ship, a galleon, but, hey, artistic license. I am not too fond of the figure because she doesn't seem like a mature woman to me...and I'd really like more of a face...but picky, picky, picky. May your sweet imaginings come true today. All right, this is one of my "give back" pages to the community, and I've been wondering if it's worth it since it takes BY FAR the most amount of time to put together each month and is usually why I'm late. I'm all over the web looking for good quotes that might match a topic, fun links, etc. But I finally checked and it looks like about 235 viewed it this month, entry page for 24, exit for 81, so that means, to me, that I need to keep it. And, to be frank, I DO use the exercises etc. for myself. I got the page proofs for Heart Fate last week, immediately handed them off to my editor friend, Rose Beetum, and now have them back and have been working on them (reading the book) all day, about 12 hours. I'm near the end, but while I was checking something out, I realized I put some other thing in a long time ago that I completely forgot and now I must handle in case anyone notices a discrepancy (ok, it concerns the Holly Residence). So I'm going to let my brain sleep on that and see how I might handle it in three sentences or less...as little as I can insert. I've cut a few lines that made no sense or contradicted other things, but haven't added more than a couple of words here and there. I am still very pleased with the book. Want to know how to use mythology, culture, fairy tales, or folklore in romance? 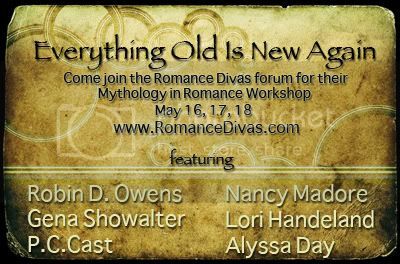 Romance Divas is hosting a 3-day workshop with some of the hottest names in the genre. It will take place at the Romance Diva Forum. All are welcome. To get access to the forum you will need to register. I'll be there, may you enjoy whatever you're reading today. Cut That Line, That Paragraph, That Page! One of the reasons I got in trouble with my scenes is because I wanted to keep a fun little line/additional payoff of a joke regarding Alexa & Bastien. I'm ready to do that professional technique of smooshing, and the paragraphs Must Go. Yes, there are lines and paragraphs and pages and scenes that I've absolutely loved but that had to go because they distracted the reader from the main story of the book. This is always a problem with Alexa, since she is an over-the-top character. I have to keep my eye on her (and her toys) every minute. I spent some time yesterday and the day before mulling over the scenes -- was it really time for this particular event to happen? What if I backed off on it and did only a precursor? What about the follow up? What was coming next? So once I knew I had to cut the line, the timeline got clearer for me. That can be a BIG clue. If you love a line and you're having a hard time writing around it, what happens if you take it out? Do things flow more smoothly? If so, the line, etc., doesn't belong in there. AND I GUARANTEE THAT YOU **MUST** LEARN TO DITCH YOUR WRITING WHEN IT NEEDS TO BE DONE. I think that one of the marks of an amateur writer is that "they'll never let anyone change their work." If you're wedded to your words, it's going to be hard to really work in this business. So those are my tips for the day. May you have a sunny day. I slept in a little late since I stayed up late, got my morning wordcount done at a reasonable time...then the day sorta fell apart. I ate and bathed and frittered away time until I HAD to get out some mailing, one contest entry and two books to folks who won them during that last Sunday chat. So off to the P.O. (in traffic and much waiting since they raised their rates today). I'm doing the catsitting thing, so I try to coordinate times with when I'm going back and forth to the East side of town -- dinner with Mom and friend re: Housesitting (Fri), dinner with Mentor and to the performance (Sat)., last brunch with friends (Sun). And MONDAY, free sneak viewing of Prince Caspian. I liked it, some sad deaths/sacrifices :(, lots of betrayal here and there and it's been a long time since I read the book so I can't comment on how true it was. The Aslan thing was a bit too much for me, probably because I know the Christian underpinnings. The theme of the film was having faith, and that's a pretty good theme, but there seemed to be an underlying subtext that if you DIDN'T have faith in a higher power you'd screw up, that people can't come up with good answers to their problems themselves, which I DON'T believe...guess I just figured out what bothered me about the movie. Some excellent special effects, but there WAS a lot of fighting if you're thinking of taking younger children to it. Not a whole lot of blood and gore, in the battles, but quite a bit death, and not only of humans -- animals, mythic creatures (gryphons), trees...(death of trees count as body count for me). So I didn't get the afternoon word count done and since I left a scene with a couple of holes in it, that bothered me. OTOH, it should pick up easily tomorrow when we're supposed to have more rain/snow/gray weather. And speaking of battles, I've been thinking about Echoes in the Dark and the construction of it...as usual there will be a long set up. I'm going to do a very short middle (hopefully), then an end slightly shorter than the set up. Doesn't look like I'll be at 400 pages, or even 500, but I'm going to shoot for 550. I'm always very conscious of rushing an ending because I've been accused of that more than once. Writing went slowly today, only got 3 pages done (again sewing my chapters together) before it was time for brunch. Could NOT miss this brunch as the restaurant we've hung at for many years is closing. Then catsat and fell asleep for quite a while. Back home and messed around, email, etc. About an hour ago I looked at my chapters and realized I'd screwed up, written two different things for the same time period, so now I have to untangle it. I really don't do this often, but it slowed me down. Did two pages that may or may not stand, and finished my wordcount. Just a rather bleh day, though I think if I hadn't had the am interruption it might have been a good day. However, wordcount WAS made, which is, of course, the bottom line. Follow your heart and magic will come. These are two of the little "blessings" I write when I sign my books. Last night my mentor and I went to a Denver School of Fine Arts event, and the people on stage were incredible, especially the three drummers. You could see the passion for their music, MUSIC, on their faces and they were having a great time. During the intermission, I turned to my mentor and said, "They're following their passion and so are we. We might not be making much money, but we're doing what we want, and that's important." There was a time, right before I seriously started writing, that I was doing well enough in the day job, nothing was going wrong, but I really didn't care if I lived one day to the next. (Ok, it might have been after I'd been dumped, which was the inciting event for me to take a course from mentor and become a writer). So following your heart, embracing your passion, is important. And maybe you won't make a lot of money, but your inner soul will be satisfied. That said, Don't Quit Your Day Job. May today be sunny and full of music and passion for you. It was one of those days. I did some wordcount in the morning on the laptop, then took a break and went up to this desktop and found out my email wasn't working. I could get it, but I couldn't send it. Messed around with the #$#@$#(*&%(#&$@*& thing all day long, removed programs, reset the computer to last December (best backup). Finally contacted my server and they said that since I'd gotten some spam they reset the socket the mail was coming from (like a day doesn't go by that I don't get spam?). They don't bother to notify in these cases. (????) During the chat, the person gave me three links that didn't work and finally had to type out step by step instructions. Just got off that chat. So all's well that end's well, but you know how you feel when you flounder around trying to figure out what went strange between yesterday and today? I swear, it's like magic spells where you have to hold your mouth JUST RIGHT. Anyway it's done, and since an email was in my outbox that I thought was snotty (responding to spam saying that my PO Box was prime realty for refinancing), I deleted it before it went. Anyway, may all your computers be perfectly behaved today. I've been slogging through this inserting thread. Actually I've SEARCHED and FOUND the scenes, modified drastically, cut and spread out, gone back and changed other scenes to correspond with the new scene, over the last week. It's been a tortuous process, but I think it's best for the story. I still have to drop in bits here and there, but I wanted to make more progress today, which I did. It's rare for a chapter to take four hours to write and rewrite. Most of my chapters are in pretty good shape when I write them, then they get polished up as I go back and forth. So spending four whole hours on ONE chapter is enough to make me crazy. OTOH, I have inserted a couple of humorous bits that I think will really please people...it made my mentor laugh out loud while she was struggling with a publishing dilemma. So may you laugh today. COME TO THE CHAT BY BERKLEY AUTHORS TONIGHT! I'd just gotten my morning wordcount done when my Mom called. I'm meeting her for Mother's Day tomorrow night and I'll be housesitting again for her friend in a couple of weeks (but I don't have to stay overnight this time). Catsitting for MY friend starting tomorrow. Anyway, yesterday wasn't too good. I worked on a scene then decided it shouldn't be in the book so spent the afternoon fretting about it and reading The Hollow, by Nora Roberts. Had some strange publishing business that I had to deal with which I can't talk about (may never be able to talk about it, sorry) and some conversations with friends who got hit by the same inept copy editor and ended up sending their entire mss. back loaded with "stets" (leave it like it is) and changes. Anyway that was yesterday. Feeling better about the work because I opened up the scene again, wanted to end it quick so I could archive it for the website, kept writing and it went somewhere I didn't know it would/could and I think it needs to stay in. In my own books, both series, I try to show you how Flair or Power works, how MAGIC works. This is a given for me. Here you see the heroine practicing her magic, and the hero doing his, and, btw, here is some more info about the planet. Sometimes it feels slow to write, but I really think that readers need to see that my h/h are competent people. And if I'm depending on these powers in some crises, climax in the end, the readers need to see it before to believe it. So though it may slow down the books, this set up is ALWAYS there. In The Hollow, by Nora Roberts, I wanted more. More use of the heroine's powers, and seeing her acceptance of them more, so I was left slightly dissatisfied. That's me as a reader, so that may be, again, why I personally spend more time on the magic. I always worry if it is slowing my plot down. BTW, if you aren't familiar with my site, I think there's an additional scene from Heart Thief that I cut showing a courtroom (JudgementGrove) case that Ailim adjudicates that didn't need to be in the book. I've been hearing from readers regarding the website update and the contest for the ARC of Heart Fate, and it's been very gratifying. Thank you. For Protector of the Flight. Enjoy all good things that come your way. On that chat Sunday, after the formal chat was done, we talked about philosophy. There were a couple of brand new writers and one of them had the idea (don't know where it came from) was that writing was to enlighten readers. That if one wrote to please readers it was pandering to them. So. I said I, like most genre writers, took a more practical view. Digressing, everyone wants to make the world a better place, and writers are no different. But when you write popular fiction, and write for a paycheck, then you need rationalization and justification. I write to entertain, and there's nothing BAD or WRONG about that. I'm pleased if I can take people away for their mundane cares (heaven knows during all my plumbing problems I LOVE being able to sink into another world, and it helps). That's enough for me. Yes, I've gotten some email (which I won't share because it's private to the people and I think self-aggrandizing for me) that makes me very, very proud. But bottom-line, I see my job as entertaining...the same as any other entertainer or sports figure. That's enough. So I told this person that, and that also themes WILL creep into your work. Since I'd had a rum and coke I was on a roll...HeartMate is about gangs. Heart Thief is about society's outcasts and redemption. Heart Duel is about arrogance, selfishness, blindness and war. Heart Choice is about loving children because they are lovable and not simply because they are your own blood, about tradition. Heart Quest is about making other people's choices for them for their own good... I think all of these themes, outer stories, topics, may shed a different slant of light on a problem someone else is struggling with. Heaven also knows that some of my beliefs and problem solving has come from books. This new writer was thrilled at the thought that s/he didn't have to "enlighten" readers. That s/he could trust him/herself to write what s/he wanted and themes would appear. That entertaining can be a good calling. Blogger now has scheduled posting which may change my blog in a couple of ways. First, I won't be tied to having to post it daily since I can schedule in advance. You may be subjected to less whines, but may lose more immediacy of my life...which can be good or bad. I may actually talk more about writing and publishing, though I've been trying to do that a little more, too. Announcements, like my CHAT ON WRITERSPACE MAY 8, 2008 9PM EDT (see link above) may actually be timely. I'm thinking of posting pre-scheduled blogs at about 5AM so it shows up better daily. Sometimes I've thought of several blogs, saved them, then cut and pasted them at posting time, which was a pain. So I am very much in favor of this option. 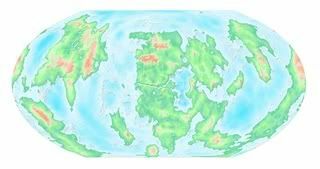 Here it is, the full map of the planet Celta. May you enjoy any world you find yourself in today. Come one, come all. I'll be giving away a book or books from my backlist. All right, the wonderful Rae Monet took pity on me and updated my website very quickly when I sent the info to her today, including the interactive intro page where we swapped out the cover for Keepers of the Flame to Heart Fate. CONTEST: An ARC of Heart Fate (and this time I might even fix the choreography problem that went out in the two I gave away at Romantic Times). READS: An excerpt of ECHOES OF THE DARK. This is from Chapter 3, I can only hope the setup and the scene makes sense. If it doesn't I may try for something else, but I'm experimenting with other chapters than 1 or 2. WORLDS: Check CELTA, which has an actual world map (talked about here before), of Celta. Smooches, and may you enjoy the site as much as I do. Just back from going out with friends to see Ironman. Really liked it (ok, I closed my eyes during several scenes, esp. the torture ones), but liked the relationships -- with friends, assistant/"girlfriend", and machines. Very good movie to look for set-ups and pay-offs. Things that happen that later play into the story. I have a friend who keeps a list of her setups to make sure she pays them off, and, I think I said I've done a set up from Guardian of Honor that I'm paying off in Echoes in the Dark (SEE I CAN REMEMBER THE NEW TITLE). Most of these I keep in my head, but my brain is not as sharp as it was...actually my Mom has always been the sharpest tack in the family box, and as she often tells me she is only HALF related to me. Much blowing up of things, excellent performances by Downey and Paltrow, minimal philosophy, would have liked a touch more theme. So, picked up and driven to the large screen, line waited in, junk food munched, movie watched, out to dinner afterwards and driven home. Good time was had by all. May you enjoy good company today. New Gena Showalter Book Out! His passion -- Beyond immortal . . .
All her life, Ashlyn Darrow has been tormented by voices from the past. To end the nightmare, she has come to Budapest seeking help from men rumored to have supernatural abilities, not knowing she'll be swept into the arms of Maddox, their most dangerous member -- a man cursed to die every night, only to awaken the next morning knowing he has to die again. Neither can resist the instant hunger than calms their torments . . . and ignites an irresistible passion. But every heated touch and burning kiss will edge them closer to destruction -- and a soul-shattering test of love . . . Though they carry an eternal curse, the Lords of the Underworld are irresistibly seductive -- and unimaginably powerful . . . Don’t miss this incredible new paranormal series from Gena Showalter! New York Times and USA Today bestselling author Gena Showalter has been praised for her “sizzling page-turners” and “utterly spellbinding stories.” The author of more than seventeen novels and anthologies, Showalter is celebrated in a wide variety of genres for her breathtaking romances featuring dark, seductive heroes and strong, appealing heroines. Readers can’t get enough of her trademark wit and singular imagination, whether she’s writing paranormal stories about vampires, nymphs and superheroes, white-hot contemporary romance or alien huntress books. Her newest series, Lords of the Underworld, promises to be her sexiest and most addictive yet. Don’t miss this intoxicating blend of dangerous passion, demons and other supernatural forces, and immortal men who are hotter than hell! Sounds wonderful! May you read a favorite author today! I screwed up, the set up scene that I thought was in the chapters isn't. Sooooo, I guess I'll go back and put it in (I have a rough of the scene somewhere), whisk that character immediately off to where he needs to be, and check any mention of him, his thread, until we get back to the chron chapter I'm working on. I think I recall that I didn't want the thread early, and now I think it MUST go in early. So it's more of a changing of the mind. Anyway, I've watched the snow and fiddled around today, turned the furnace on again last night. Regarding subplots, secondary threads. Like everything else they should be woven through. Sometimes if one isn't working it needs to be pulled out. In this case, this thread is also affecting my heroine emotionally, and though I don't know that I referenced it much, I should probably reference it a little more. In any event, I don't think the fix will take more than a couple of hours. May all your plans go well today.